BETTER PRODUCTION MMS JUNE 2018 122 mmsonline.com SHOP MANAGEMENT of these two segments. A job shop can think of itself like a hospital wherein the emergency room operates as a separate "mini-hospital" within the main facility for rapid care delivery. Ideally, the average lead time to deliver care to any given patient is short. Rationalize the Product Mix Annually At the end of each year, eliminate the "cats and dogs"—those products that are losing money. 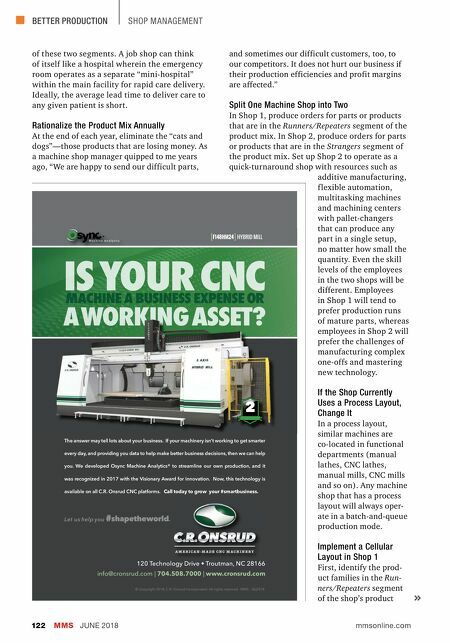 As a machine shop manager quipped to me years ago, "We are happy to send our difficult parts, and sometimes our difficult customers, too, to our competitors. It does not hurt our business if their production efficiencies and profit margins are affected." Split One Machine Shop into Two In Shop 1, produce orders for parts or products that are in the Runners/Repeaters segment of the product mix. In Shop 2, produce orders for parts or products that are in the Strangers segment of the product mix. 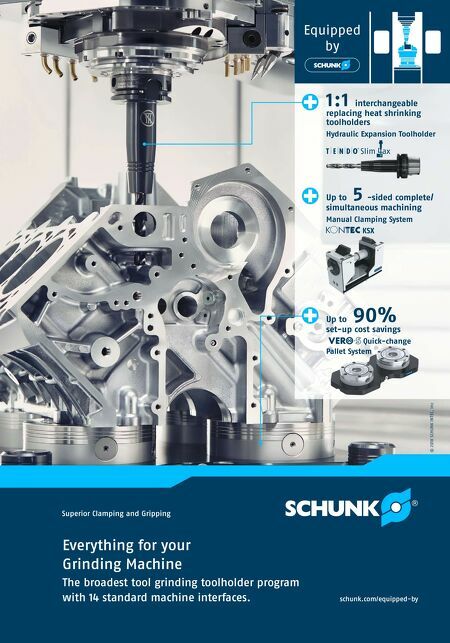 Set up Shop 2 to operate as a quick-turnaround shop with resources such as additive manufacturing, f lexible automation, multitasking machines and machining centers with pallet-changers that can produce any part in a single setup, no matter how small the quantity. Even the skill levels of the employees in the two shops will be different. Employees in Shop 1 will tend to prefer production runs of mature parts, whereas employees in Shop 2 will prefer the challenges of manufacturing complex one-offs and mastering new technology. If the Shop Currently Uses a Process Layout, Change It In a process layout, similar machines are co-located in functional departments (manual lathes, CNC lathes, manual mills, CNC mills and so on). Any machine shop that has a process layout will always oper- ate in a batch-and-queue production mode. Implement a Cellular Layout in Shop 1 First, identify the prod- uct families in the Run- ners/Repeaters segment of the shop's product 120 Technology Drive • Troutman, NC 28166 info@cronsrud.com | 704.508.7000 | www.cronsrud.com IS YOUR CNC MACHINE A BUSINESS EXPENSE OR A WORKING ASSET? [ F148HM24 ] HYBRID MILL Let us help you # shapetheworld . © Copyright 2018, C.R. Onsrud Incorporated. All rights reserved. MMS - 06|2018 The answer may tell lots about your business. If your machinery isn't working to get smarter every day, and providing you data to help make better business decisions, then we can help you. We developed Osync Machine Analytics® to streamline our own production, and it was recognized in 2017 with the Visionary Award for innovation. Now, this technology is available on all C.R. Onsrud CNC platforms. Call today to grow your #smartbusiness.